You’ll be floored by the ceiling of Sant’Alvise. Nothing mattered to me more at that very moment than finding a canal-side gelateria and indulging in a cantaloupe gelato. As I hunted for my treat in the Cannaregio sestiere, or district, I noticed the silent Sant’Alvise and its sunbathed campo. The unadorned brick building did not intrigue me enough to postpone my dessert quest. Nevertheless, I knew I wouldn’t be in this part of town again, so I crossed the empty square and entered the church. All thoughts of ice cream melted away like a host on the tongue. Commissioned in 1388 in honor of St. Louis by a noblewoman to whom the saint appeared in a dream, Sant’Alvise features Venice’s first hanging choir, added in the 15th century to accommodate the nuns from the adjacent convent, who would remain unseen behind the grill for the entire service. For the main attraction, I emerged from under the choir, looked up, and was floored by the ceiling. 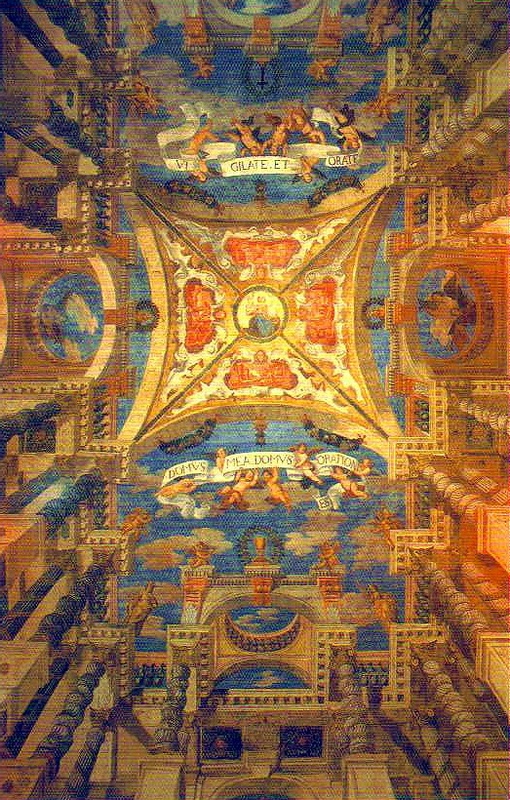 The colorful trompe l’oeil fresco, busy but not overworked with false arches, columns, and eaves seemingly reaching up to innocuous clouds and cheerful cherubim against a blue sky, is one of the most magnificent optical illusions in all of Venice. What made Sant’Alvise all the more magical was the fact that I was the only person there — nothing short of a miracle in this unique city of fewer than 60,000 souls that received 20 million visitors in 2012. But was it divine intervention or just good timing? Perhaps a little of both, yet the lesson I had learned during my weeklong visit was proven once again: The “lesser” churches stand in very good company with those that receive the winged lion’s share of attention and the most maddening number of visitors — they’re just as beautiful and, even better, you’ll have them all to yourself. Cannaregio is the least visited of Venice’s six sestieri, and as I traveled farther from the Grand Canal, the alleys grew quieter and the bridges less crowded. The crushing number of map-toting tourists thinned, and I found myself experiencing a refreshingly different Venice. Cannaregio is largely a workaday neighborhood where you’re more likely to find a hardware store than a souvenir shop. It’s also home to two other magnificent churches, one of which, Madonna dell’Orto, stands along the same canal as Sant’Alvise, and, like its neighbor, I was its sole visitor. This red-brick church was originally built in the 14th century in honor of St. Christopher, patron saint of travelers — and of the gondoliers who ran a nearby ferry service to the northern islands of the city. He was demoted when a sculpture of the Madonna and Child that was believed to have miraculous healing properties was found in a nearby garden (orto). That statue was moved into the church, where it remains today, and Christopher was turned out, where he still stands at the entrance above the elegant double-arch, one Gothic ogee, the other Renaissance. At least he’s in good company—the Virgin Mary and the archangel Gabriel accompany him at the doorway, the twelve Apostles stand in individual niches along the sloping façade, and Christ and the four evangelists peer down from atop the campanile. 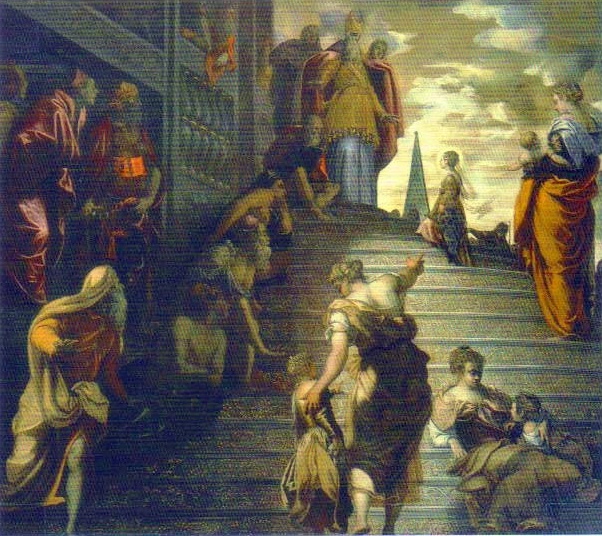 Figures in Tintoretto’s Presentation of the Virgin in the Temple in Madonna dell’Orto practically come to life before your eyes. Madonna dell’Orto was the parish church of the prolific artist Tintoretto, whose work may be admired all over Venice and who was buried in the church upon his death in 1594 — a tremendous honor reserved for the very special few, as most deceased Venetians were interred on a separate island a short vaporetto ride away. Among his many paintings now surrounding me, it was his Presentation of the Virgin in the Temple that utterly captivated me. Young Mary, clearly the focal point, climbs up a curving staircase, set before the brightest part of the background sky. The imposing high priest looks down at her from atop the stairs; all the other figures, brilliantly illuminated or mysteriously cast in shadow, twist, turn, and point at the virgin, except for one curiously bored woman lounging on the stairs with baby at her breast and her back toward Mary. So striking was its realism — from the curls of the ladies’ hair to the intricate design of the stair risers — that if I stared at it any longer, I wouldn’t have been surprised if the figures started to move. Upon completing my visit here, I was grateful that Venice in Peril chose Madonna dell’Orto as its first major restoration project following the devastating floods in 1966. Farther into Cannaregio, I arrived at the nearly deserted campo of Santa Maria Assunta and waited for the great doors to open at the appointed hour. The only sounds came from two boys practicing their soccer skills in front of a crumbling old palazzo, and the hushed, almost reverent conversation of the three other travelers waiting to enter. Santa Maria Assunta, commonly referred to as Gesuiti in acknowledgment of the Jesuits who built it between the mid-1710s and the mid-1720s (and not to be confused with Gesuati, in the Dorsoduro sestiere), commands attention, with its ornate Baroque façade of Corinthian columns and topped by Mary, surrounded by angels as she ascends into heaven. With only one window on the façade and buildings pressed against either side of the church, I was expecting the interior to be dark and, despite the imposing front, somewhat small. Upon entering, I was delightfully surprised by its grandiosity and brightness as well as the overwhelming but harmonious ornamentation. 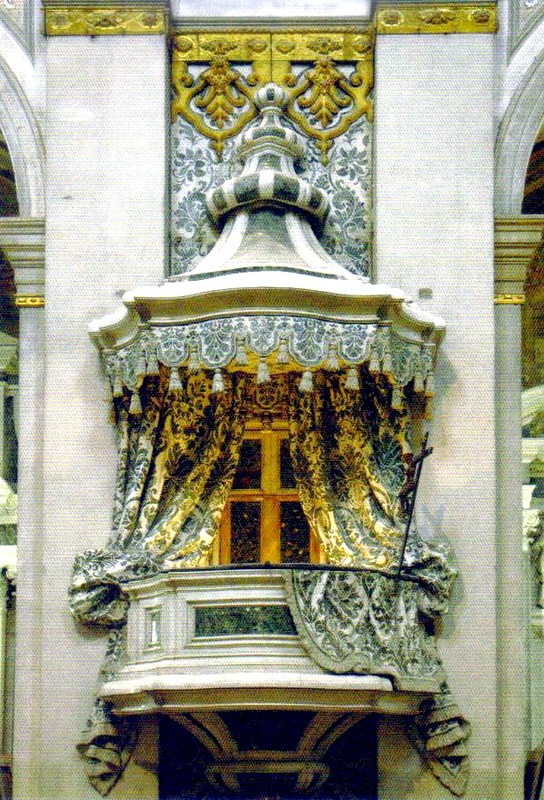 I was lured directly forward, past the side chapels and under the complicated stucco ceiling, to the arresting high altar—a tabernacle covered by lapis lazuli, a globe sculpture with the Father and Son watching over it, and ten corkscrew columns of green marble supporting a huge baldachin. It’s damask, right? Wrong. It’s all spectacular inlaid marble in Santa Maria Assunta. As I took a seat in the first pew and gazed at this magnificent work, envying the talents of the 18th-century artisans, I wondered if, judging by the monumentality of it all, the Jesuits had something to prove when they constructed the church. Indeed, they did. This church was to mark their triumphant return to the city after being expelled in 1606 for siding with the Pope against the Republic of Venice — it had to be impressive, even beyond their usual elaborate churches. 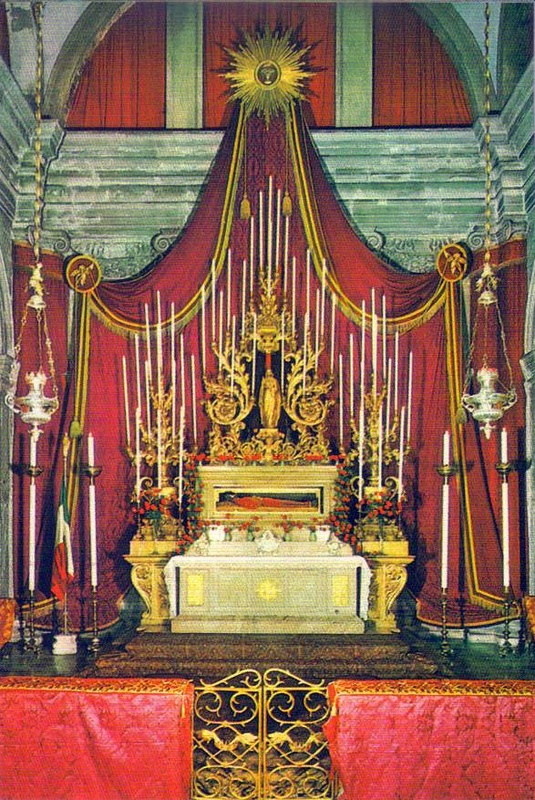 They secured the patronage of the wealthy and powerful Manin family to pay for the façade and altar — a stroke of good timing: Less than a century later, in 1797, Ludovico Manin, the last doge of Venice, surrendered the reigns of power to Napoleon, and the city began its decline. My concentration was broken by a raised voice that sounded louder than it actually was in the expansive open space of the nave. An elderly Italian woman, clad in black mourning from head to toe, was reading the riot act to an obvious tourist — a post-pubescent girl clad in hardly anything, a definite no-no in Venetian churches. She didn’t understand why she was being scolded, and she eventually sashayed away, still oblivious, but I continued to look in that direction, now attracted by the green and white damask on the wall behind where they had stood. I began to notice the pattern everywhere — not only running up the walls, but on columns and panels, in curtains and drapery, in fringes and swags. Upon closer inspection, I ran my hand along it to verify what my eyes were disbelieving. I couldn’t help but smile at being taken in by one of Venice’s most enchanting tricks. It’s not fabric at all; in fact, none of it is as it appears. It’s all inlaid marble, right down to the tassels on the left-aisle pulpit and a swoop of curtain that’s tied to one side. Despite its location near the swamped rail station, San Geremia e Lucia is a pleasant oasis from the crowds. The campanile is one of the oldest in the city, a remnant of the 13th-century church that was replaced by the present one in the 1750s. The outside of the church is not particularly notable, and the exteriors facing the campo where a bull hunt used to be held are in need of repair. But I was more interested in what was inside. After a week of discovering a few of Venice’s remaining secrets, I wanted to give thanks for everything I had seen. This would be the perfect spot. The mummified body of Saint Lucy reminds you of the gift of sight. The Greek-cross plan is united at the center under a staggeringly high dome, from which hangs a chandelier on one of the longest chains you’re likely to ever see. The interior is bright and airy, and as I made my way past the vivid painting of my namesake being stoned to death, I approached my ultimate destination. When the church of Santa Lucia was being demolished to make way for the rail station, San Geremia welcomed the body of Lucia in 1863. The corpse of the patron saint of the blind and visually impaired (and the national saint of Sweden), portrayed in art holding her own eyes on a plate, lay before me, protected in a glass case and dressed in a red gown, with her small, brown, mummified feet exposed. Here she was, the woman who was martyred in Syracuse, Sicily, 1,700 years ago and who, according to a disputed legend, plucked out her own eyes to make herself less desirable to a suitor in order to maintain her chastity. When I took a seat near her, I offered up a little prayer in thanks for my own eyesight, grateful for the gift that had allowed me to see what so many of Venice’s visitors are simply blind to.